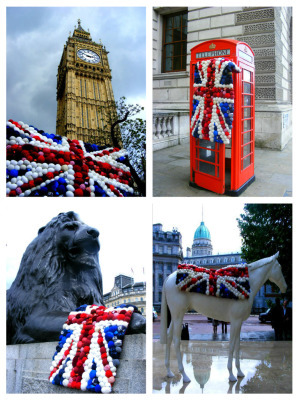 This mighty exclusive and unique wall hanging has been created using a parade of different fabrics to form Great Britain's Union Jack, all attached on to a thick red glittery backing. 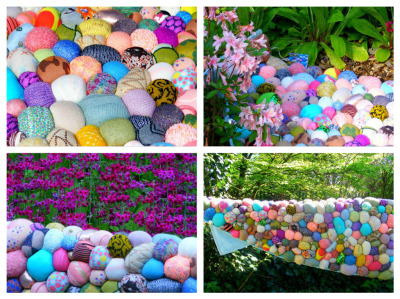 All colors of nature in the summertime, exclusively chosen designer knitwear of soft and bouncy handmade pebbles with a lavishly thick centre piece of grass effect , made from lambs wool and organza. This Rug will impress any room and bring joviality to any picnic area. 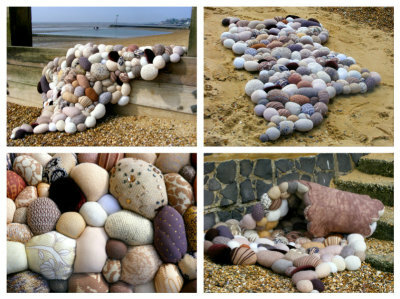 Soft and cushiony plump pebbles of subtle pastel shades, with hidden gems, and embroidery, attached on to a thick pastel teal rug backing, very ornamental and beautiful. 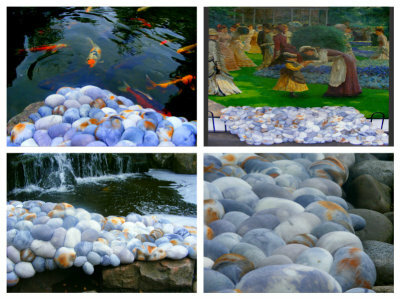 An exquisite soft and bouncy 3D pebble Rug, created by using different wool samples , added sequins and beads embroidery and glitter, with a non slip rubber backing, try the barefoot experience, you'll fall in love. 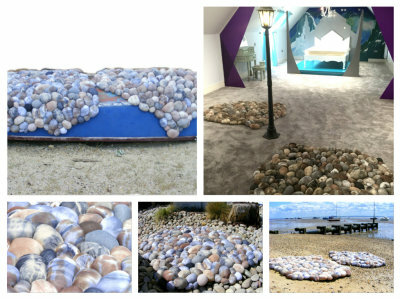 A handmade pebble rug with Beautifully selected soft tone colors, inspired by Marilyn Monroe, it's blonde it's quirky, it's bubbly it's feisty and it's individual, it's also very beautiful and curvaceous. 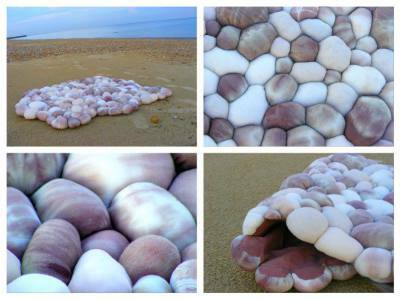 Soft squidgy pebbles made from a cream lycra fabric, that has been tie dyed with a light brown, the backing is brown dyed thick cotton. 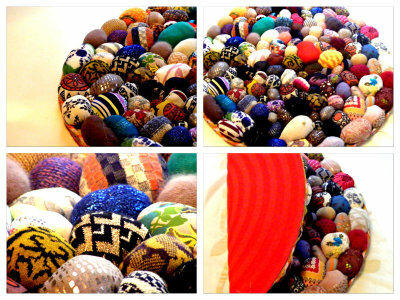 This rug shimmers in the light from the glitter in the fabric. 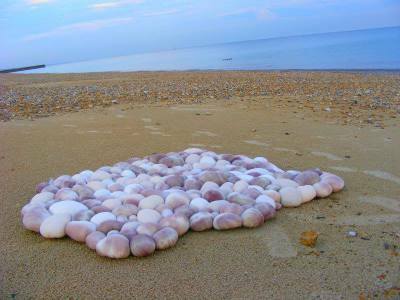 Realistic handmade fabric pebble rugs, of grey/brown tones, tie dyed to create a water ripple effect, these area Rugs will compliment any room. 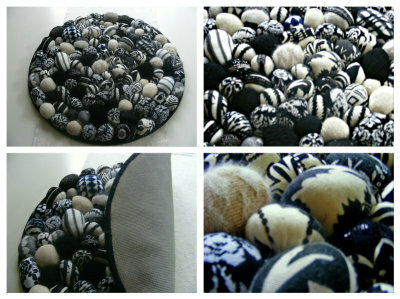 These rugs can be re produced . 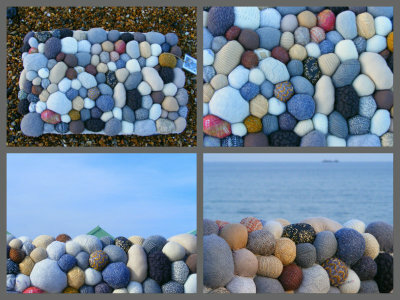 A quirky tactile Rug that has been hand dyed and hand painted to give a realistic pebble look, it's soft and squishy with a calming tranquil effect, will make any room cheerful. 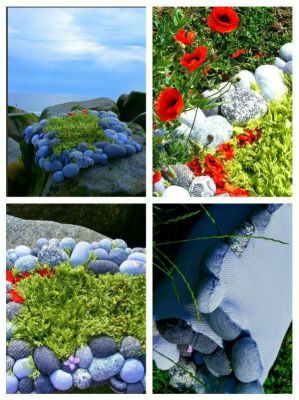 A Rug made from a mixture of fabrics and textures, to form naturalistic pebbles green wool has been latch hooked to give you realistic grass and atatched to a soft rubber backing, a true garden feature to behold in your home, the poppys are made from organza fabric, a very ornate piece of art for your floor. 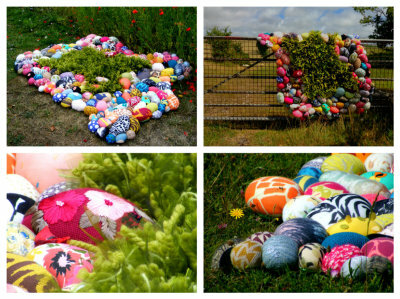 An array of beautifully decorated Easter egg pebbles, from carefully selected designer knitwear samples form this exquisite unique rug. 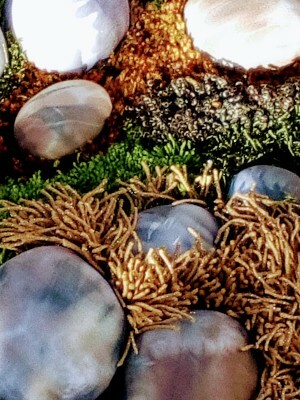 Soft 3d pebbles of cream cottons and crushed velvet, attached on to a very thick heavy chocolate brown woven backing, making it irresistible to touch. 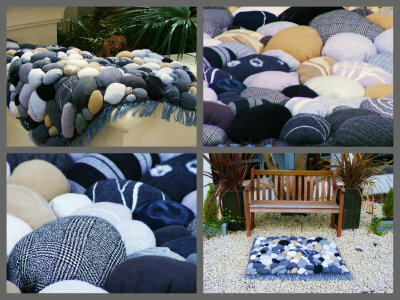 A mixture of wools and gems combined to create this wonderfully soft pebble rug, with a soft cushy backing, very cosy. 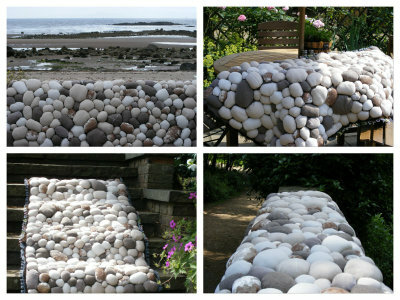 Handmade soft 3d pebble rug, of grey /cream tones, attached to a thick hand woven cotton backing. 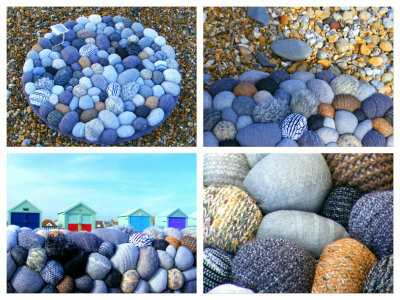 Soft and squidgy realistic pebbles in neutral colors of Brighton beach, made from different textures of wools. 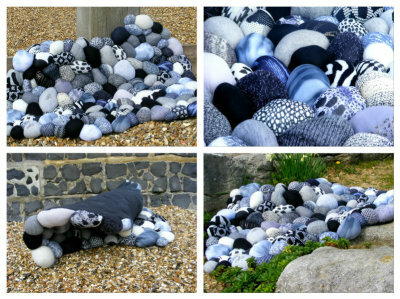 Grey's and black's mixed together to form this fanciful rug of soft pebbles, designed to sit well in any room. 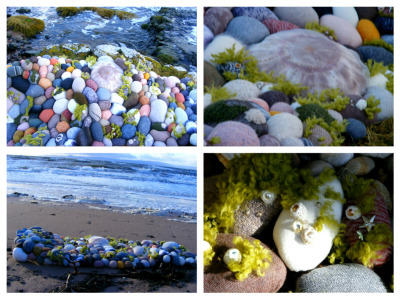 An ornate organic landscape . 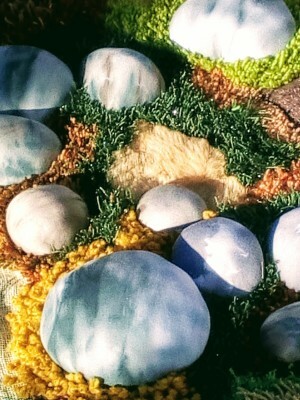 with it's decorative arrangement of soft plush hand dyed realistic pebbles and textured luxurious grass effect. hand created using carefully selected fabrics and yarns , an inspiration taken from Royal Highgrove and strongly influenced from the natural world, it's an indulgent piece of home furnishings, creating an irresistibly cozy appeal that will enhance and beautify ,, solving any space issues.